You can’t play golf if you don’t have any of the equipment. When first starting out, it can be tempting to splash the cash on all the latest technology and fashions, but you don’t need to do this. While you can only fit 14 clubs in your bag at any one time anyway, you won’t even need this many when you’re learning to play the game. Invest in a driver, a putter and a sand wedge and add a couple of hybrids into the mix, too – these are easier to play with than normal irons if you’re a beginner. Make sure you try out the club before you buy it: you need to know that it matches your swing. If you’re not sure, ask in the shop for help! When you’re learning to play golf, you’re effectively a blank slate: you won’t have any of the bad habits that more experienced players developed. It’s therefore, important, that you seek the help of a PGA professional to help you with the mechanics of your swing and how to hit the ball properly. This may seem expensive at first, but it will be well worth it further down the line when you have a better technique than all your friends. 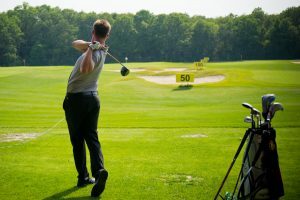 Whether you’ve signed up to become a member at your local club, or you’re simply heading out to the driving range and pitch and putt for an hour after work, you should focus on practicing as often as you can if you want to improve as a golfer. When you feel as though you’re ready to take on a proper course for the first time, you should start small. Rather than heading for the championship course half an hour down the road, why not try a par 3 or ‘executive’ course? These types of courses have holes that are less than 200 yards, so you can hone your game before progressing to the longer, more tougher holes. You should know your etiquette before playing with other golfers. Don’t take too much time with your shot, wait your turn and always take care of the course you’re playing on: replace any divots and rake the sand back if you’ve been in the bunker. So, now you’ve read this: what are you waiting for? We’ll see you out there on the course soon!